Revenue Usage: KEDVII 1901 issue 2d. 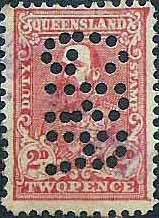 Rarity Scale: KEDVII 1901 issue 2d R4. Background: George R Ryder Limited were tailors and men’s outfitters in Brisbane and Toowoomba from at least 1901. There early advertisements also claim an office in London. They occupied a retail store in Queen Street but they were also active in mail order delivery. By 1926 they had expanded to Roma and Townsville. In 1928 George Ryder died and the site in Queen Street was taken over by G J Coles in 1931, however as a company G R Ryder continued to trade from another location in Queen Street. To date no document, company cachet, application or postal item has been found to prove that GRR was a device used by George R Ryder Limited. 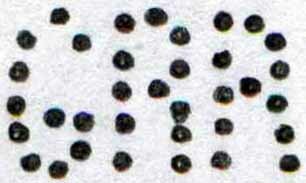 However the company was known to use a logo GRR (see below) that was similar to the GRR pattern(s). What is more they were involved in Mail Order sales and this is an activity that requires a great deal of postage and it is common to find mail order / retailers to be perfin users. Device: The GRR pattern is rarely found and little is known about it. This is odd as the known examples are clear strikes of apparently sound devices. However despite this evidence the GRR device was short lived. Most likely it was a single head device. 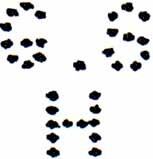 The pattern is found on Revenue and Postage stamps around 1910 and another similar GRR pattern is found used on Postage stamps in 1912. QV [Widow Weeds] 1d R4. 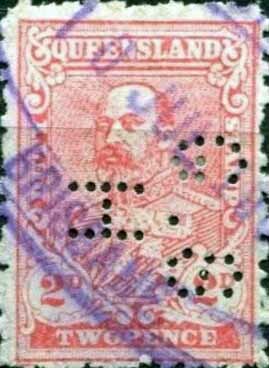 KEDVII 1901 issue 2d R4. Background: *George Samuel Hutton (1848-1913), accountant, was born on 1 October 1848 at Sheffield, Yorkshire, England, son of George Hutton (1820-1902), civil servant, and his wife Mary, née Dowenend. George was educated at Manchester Grammar School before he migrated to Queensland with his parents in November 1862 on the “Prince Consort”. Initially George helped on the family farm but later he worked briefly in the railways then joined Clark, Hodgson & Co., merchants at Ipswich and Brisbane. From the late 1870s Hutton worked as an accountant with the Brisbane branch of S Hoffnung & Co.. In October 1893 he commenced practice as a public accountant specializing in insolvencies and liquidations, and due to the harsh economic times his business flourished. His audit clients included his old firm Hoffnung's and the Queensland National Bank, and he also managed the Queensland branch of the Manchester Assurance Co. He was a member of the Brisbane board of advice for the Federal Institute of Accountants, and later founder and principal partner of G. S. Hutton & McFarlane. Hutton was commissioned in the Queensland Defence Force in 1876 and retired as a captain in 1897. Through this service he was given a land order certificate for fifty acres (20 ha) of land in the Gympie district. He was a member of the Hamilton Town Council in 1902-11 and Mayor in 1905-06. A Government appointee on the committee of the Brisbane General Hospital in 1909-13, he was active in Liberal Party politics but never stood for parliament. On 13 October 1885 Hutton had married a widow Catherine Palmer, née Chapman, and they had two daughters and a son. They lived comfortably at the family home “Bay View” at Albion in Brisbane. It was a fine house in spacious grounds and his aged parents lived in an adjacent smaller house. Hutton died of cancer on 4 August 1913 and was buried in Toowong cemetery. The company of G S Hutton & Macfarlane continued to trade into at least the 1970’s, after which they were acquired and absorbed by the large Accounting firm of Coopers & Lybrand. Device: The GSH.a device is not proved to the user George S Hutton, and Accountants are not often users of perfins devices, however the letter combination, known use in Brisbane and match to the company name are compelling evidence to support George S Hutton as a provisional user. It is possible that George became aware of the use and value of perfin devices when working at S Hoffnung & Co, as this company was a long term user of perfins, from 1887 until the 1960’s, see the S chapter. The GSH.a device was a single die device and this has been proved by sighting multiple strikes that show no consistent relationship to each other. The device was only ion use for a short time from 1899 until 1905 and the company has no other known devices.